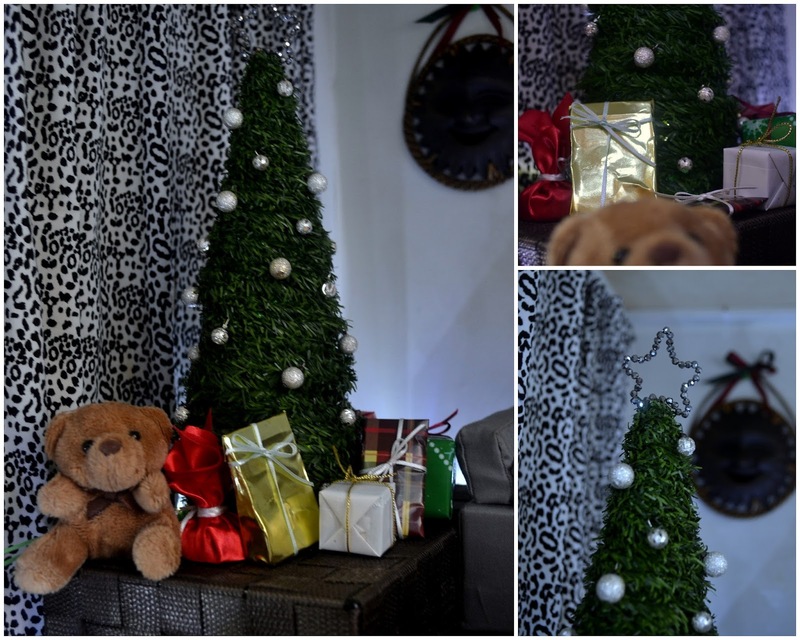 Finally, I set and gave the time to build my dream Christmas diorama! Yup - that's how I made the dream come true - I intentionally gave it time! Being able to do this made me so happy and I felt like my 2015 was such a successful year. Browsing the final photos of the photoshoot leaves a really great feeling, but the entire process of building the diorama was priceless! Let me share with you how fun it was to set up all this jazz. It took me about two weeks, from concept to coming up with the materials, to creating the girls’ clothes and the room décor, to styling and then finally to the photoshoot, to finish. I divided my tasks into two major parts – the girls, and the room. I worked first on the girls, mainly because fashion making and styling pretty much are more my domain than the diorama making. The girls to star in the photoshoot were then chosen along with the fabrics to be used for their dresses. At atelierniSHASHA, it is essential that the girl complements the fabric, and vice versa. I chose mostly my Barbie dolls because they look cheerful and excited to be in this diorama. I dug for fabrics that are shiny, sparkly or glittery to match the season then started matching these to my chosen girl squad. Although my Anouk and Portia don’t look too jolly with their almost-pursed lips and poker faces, they seem to make it work by the fabrics chosen for them. 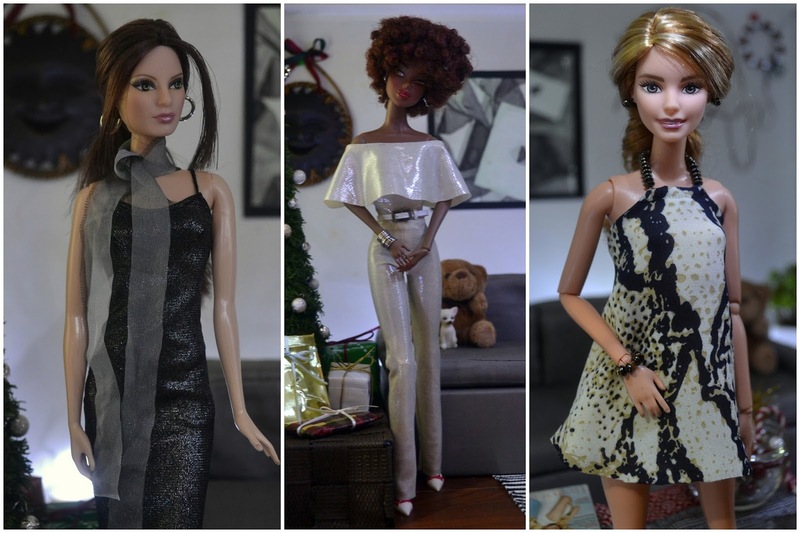 I worked on the girls’ OOAK (for now) dresses for about 4-5 days. It took me this long as I made sure I have the best-fitting dress for each of the girls. Christmas only comes once a year, you know. I spent about a day or two for hair-styling and accessorizing. I already had a room box so all I needed were things to put in it. I used my existing couch, painting, some acrylic center tables, decors, rug and the trinket caddy that works as the Christmas tree platform. What I added in the diorama are my curtains, the Christmas tree, the presents, the center table ornaments and some wall décor, all made by yours truly. I made four panels of curtains, two for each window. They are made from a thick fabric, which I think I picked from the upholstery isle. The Christmas tree uses a thick cardboard as a frame. I punched some holes into the cardboard before securing it into a cone. The holes are meant to show some flickering lights that I have put inside the cone, to stand as my Christmas tree lights. Then I wrapped the cone with the green, wire-stemmed “leaves” that I wrapped around the cone. The tree was super simple to make. I added hooks unto my silver balls, framed a string of Swarovski-like crystals into a shining star, hung all of them on the tree and voila, my Christmas tree. For the presents under the tree, I collected different types of papers and cords and ribbons from my stash. I remember watching some youtube videos as to how make miniature presents. To add some holiday pizzazz to the center table, I rummaged my beads box and collected a good mix of red and white pearl-like beads, some crystal-looking ones, and iridescent smaller ones I oftentimes use for making doll bracelets. I instantly thought of using this red and white cord I found somewhere in the house to add to the color theme, but suddenly it started disguising as candy cane in some photo angles. I also added some glittery pieces I cut from our real Christmas tree décor LOL! I put all these tiny things into my glass bowl, and placed them on the acrylic tables along with the girls’ scarves, beauty magazines, and VOILA, a center table fit for the Yuletide season! I also made some wall décors from my ribbons and pearl beads as my wall looked so white and lonely next to all these fun stuff. Now, for the lighting which we all know is very crucial to every photo shoot. I realized early on that my study lamp cannot provide all the light I needed, so I got myself a real Christmas lights set in non-colored, bright white bulbs. I put them around the floor, hidden at the back of the Christmas tree, then at the back of the couch, then around the plant vase to the right. I put the rest of the lights at the front of the room box to provide more lighting. I placed my study lamp next to the left window for added light. Since I intend for the pictures to look sparkly, I decided to take pictures at night time. This reminds me of the Filipino tradition of Simbang Gabi, which literally means evening mass in English. It was an event that everyone looked forward to. Most especially, kids are excited for the Christmas Eve mass. After the mass, we would then have our Noche Buena feast at home. And for the kids to receive their presents the next day, we would have to be asleep as Santa drops our present. Peeping means not getting any present the next day. Sigh, great memories of childhood. So, yeah I digressed again haha! There goes my diorama’s behind-the-scenes story. Making it was a lot of work, but the experience was so much rewarding than I expected it to be. That is why I am sharing it with you, guys. I hope you enjoy this post. And again, I wish you lots of cool miniature projects, fabulous dolls, more wonderful doll friends to come, and awesome life experiences and beautiful new memories to make in 2016. It shouldn’t be too hard when we have each other, right? See you again on my next post! I love the amount of detail you've put into this diorama - every element seems so well thought out. I especially love the tree, because it really looks just like the full size collapsing coil tree that I have - it's a perfect miniature! Thanks so much, jSarie! I'm soo glad you love the tree - it was quite the only thing I can do with what I have and it's awesome to know it is a mini-mi of your own tree! Thank you so much! It may look well thought out, but what I did was just tap on what I knew a Christmas setting would be, and grab my own materials box for something to make use of. Wishing you the bestest new year, friend! Congrats on a job well done! The room looks great and your ladies look fabulous. My fave is your Asian doll. She is working that beautiful dress! We are so looking forward to your 2016 creations. Looking forward to your creations and fun photo stories, too, dear! Hugs! First, I want to say that your ladies looks stunning! I love every single one of the outfits you made! Your Christmas dio is also amazing! I can tell you put a lot of work into it and it certainly shows! Thanks for sharing! Thanks so much, Phyllis! So glad you like the outfits and the dio.. It was indeed some work, but it the feeling while I was building it, and finally looking at the photos, was just priceless. =) That's why I'm so excited to share it with you guys! I'm so happy you were able to make your dream come true, and that you did yourself all the decorations. I can understand why you started from the girls and their outfits (which are perfect), for me too everything starts from the outfits! Oh, Billa.. super thanks, dear.. It's always the outfit that dictates their mood, or what's about to happen LOL! Happy 2016 to you! Your room box is amazing, and this is a lovely Christmas dio. It was fun to read about your process as you took this idea from concept to creation. I agree with your comment about the Barbie gals looking cheerful and excited to be part of the dio. I bought the doll in the third photo, too. I just adore her face. Looking forward to your lovely new creations this year! Looking forward to what everyone shares this 2016! Hugs!